Downtown Eyes is a privately owned optometric practice with two convenient Minneapolis area locations. Our mission is to provide the highest quality eye care, eyewear and service to our patients. Our eye doctors perform eye exams, contact lens fittings, children/infant eye exams, LASIK surgery co-management, and treatment of eye diseases such as dry eye, diabetic eye disease, glaucoma, macular degeneration and cataracts. We utilize the latest technology and up-to-date instrumentation which allows us to give thorough eye examinations and the most accurate prescriptions. At Downtown Eyes, we adopt a personalized approach for every patient. Our staff is friendly and welcoming – expect to feel at ease while undergoing an eye examination or treatment at Downtown Eyes! We also dedicate a considerable amount of time and energy to make sure we showcase a wide range of frames so that every person that walks into our office can walk out with high-quality, affordable frames that they love. It’s not until our eyes start to fail us that we realize just how much we depend on them. When you start squinting, experiencing headaches caused by eye strain or when you need new frames or contacts, an eye care specialist from Downtown Eyes will be here to take excellent care of you. Our doctors are experienced and dedicated to helping adult, child and infant patients. Allow them to help you see the world better than ever before! Downtown Eyes is your eye care headquarters. if you work downtown, please feel free to call or stop by our office, which is located in the skyway of the US Bancorp building between Target and Macy’s. Or if you’re in the suburbs, head to Downtown Eyes Crosstown in Richfield. Whether you need contacts or glasses or are having an eye emergency, our friendly staff and doctors will take care of you. We are happy to work with your busy schedule and are confident we can find a day and time that is convenient for you. Is it time for your eye exam? Schedule an appointment today by calling Downtown Eyes Minneapolis at (612) 333-EYES (3937) or Downtown Eyes Crosstown at (612) 869-1333. We also have a convenient online contact form right here on our site. We look forward to seeing you! 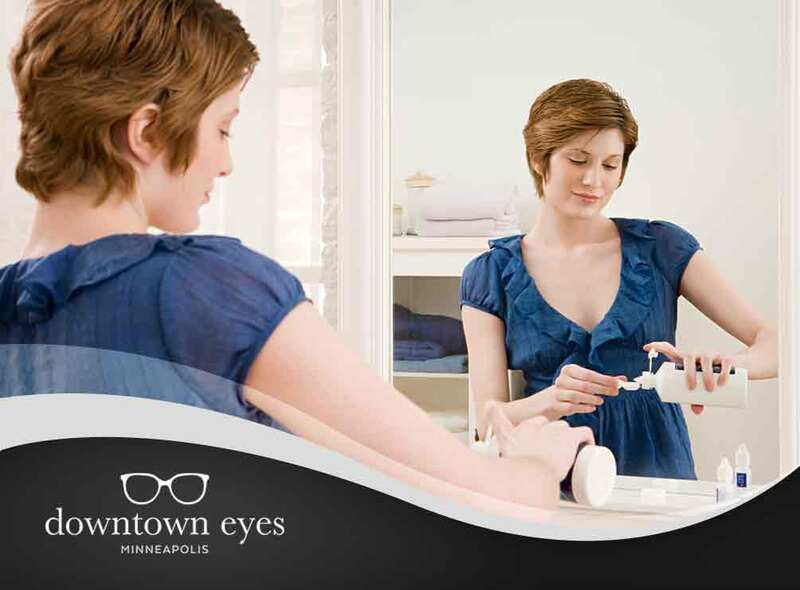 Downtown Eyes is a privately owned optometric practice in the heart of Downtown Minneapolis. Our mission is to provide the highest quality eyecare, eyewear and service to our patients. We utilize the latest technology and up to date instrumentation which allows us to give the most accurate prescriptions and thorough health examinations. Our eye doctors perform eye exams, contact lens fittings, children/infant eye exams, LASER surgery co-management, eye disease treatment and management, such as dry eye, diabetic eye disease, glaucoma, macular degeneration and cataracts. Conveniently located in the skyway of the US Bancorp Building, we are able to provide our patients best in class eye care right where they work, eat and play! At Downtown Eyes, we adopt a personalized approach for every patient. Our staff is friendly and hospitable – you will be made to feel extremely comfortable and at ease while undergoing eye examinations or treatments. From start to finish we hope to provide every patient with an exceptional experience. We also dedicate a considerable amount of time and energy to make sure we showcase a wide range of frames so that every person that walks into the office can walk out with high quality, affordable frames that they love. We look forward to seeing you for your eye exams in Minneapolis! We want to help you keep your eyes healthy. That’s why we recommend an annual eye exam for all of our clients. Some of our clients like the way they look with their glasses on. Others choose to wear contact lenses instead. Your eyeglasses and frames should match your personality. Check out the different brands we offer! At Downtown Eyes, our goal is to diagnose and treat dry eye and other ocular surface diseases that could cause red eyes. Studies suggest that, over time, exposure to the blue end of the light spectrum from computer use could cause long-term damage to your eyes. 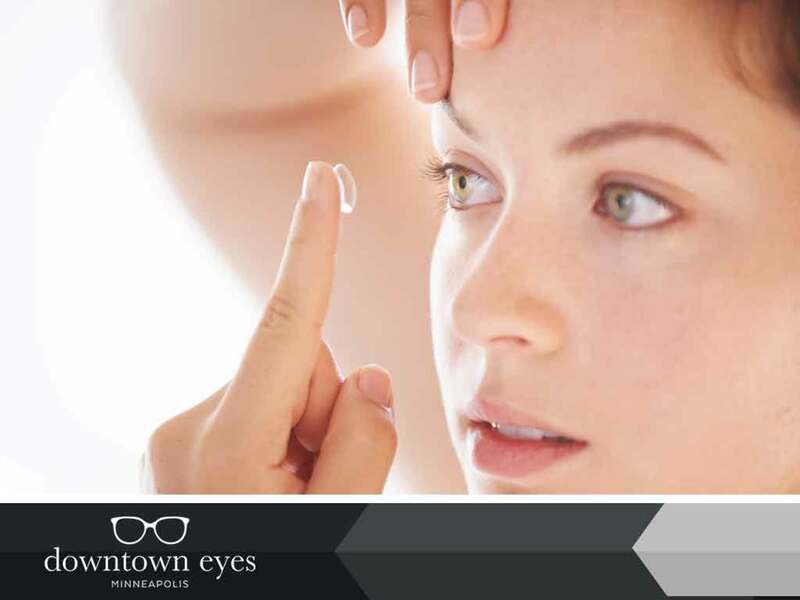 Having trouble deciding between contact lenses and eyeglasses? Both options offer solid benefits, but depending on your personality and lifestyle, you might prefer one over the other. To help you decide, our top rated eye doctor in Minneapolis, MN, discusses the features and benefits offered by each choice. In addition to correcting your vision, the lenses of your eyeglasses can also shield your eyes from drying winds, dust, and other debris. We offer computer and anti-reflective lenses that keep blue light from damaging your eyes. Eyeglasses require minimal maintenance and can last for many years, making them a cost-efficient choice.